Zade White and sister Miana White ride at the Truckee Bike Park in May. Incline may have its own bike park soon. Visit facebook.com/InclineBikeProject to learn more about the Incline Bike Project. For full details of projects discussed at the Dec. 14 IVGID meeting — including the bike park and Ordinance 1 — visit ivgid.org, click on “Board Meetings & Agendas” and scroll down to the meeting links. INCLINE VILLAGE, Nev. — A mixed crowd of about 50 people came out to the Dec. 14 IVGID Board of Trustees meeting, many interested in one item in particular — a proposed bike park to be constructed near the Incline Village Recreation Center. IVGID Director of Community Services Sharon Heider explained that bike parks and pump track bicycle courses are becoming increasingly popular, and that the area between the Recreation Center and Incline Way is likely an ideal spot to build a track. In 2014, a group of Incline Village residents banded together to create the Incline Bike Project (IBP). Working together with the Incline Tahoe Foundation (which helped raise funds that year to install the Incline Disc Golf Course), IBP started fundraising to design and create a bike park in Incline Village. Following the board’s approval in 2015, IVGID moved forward with preliminary design and permitting evaluation, and in April 2016, trustees approved $50,000 in 2016-17 capital improvement fees to support bike park construction. At the Dec. 14 meeting, IVGID staff asked the board to allow them to create a Memorandum of Understanding between IVGID and IBP with more details on the proposed park and bring it back to the board for approval. “We are asking you to approve and develop an MOU with the Incline Bike Project so that they can continue fundraising,” Heider said. 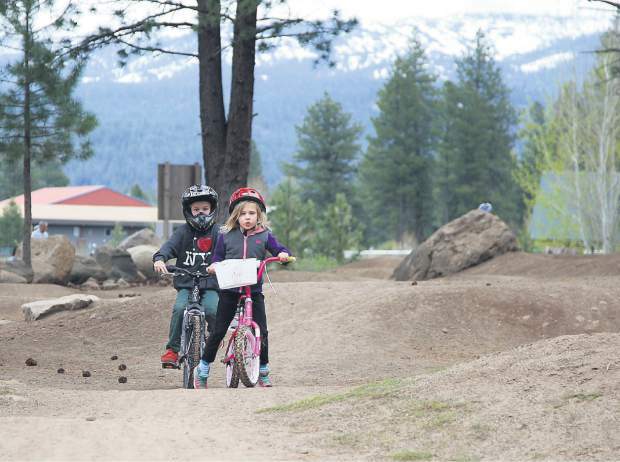 From a regional standpoint, in 2012, a volunteer-supported, privately funded group began building the Truckee Bike Park — which has since grown into a major recreation draw that includes a pump track, dirt jumps, flow lines, dual slalom and drop zone — at Riverview Sports Park. While details are still being developed, IVGID Communication Coordinator Misty Moga said the proposed park in Incline is expected to take up an acre and a half of space. According to IBP, this proposal is separate from a potential future bike park to be constructed at Diamond Peak, which has been suggested as a potential summer improvement as part of the ski resort’s master-planning process. The board unanimously approved the initiative to move forward with the MOU. Trustee Jim Hammerel said that what is nice about a community project like this is there is very little infrastructure needed for a bike park. Trustee Phil Horan added that as a community, Incline needs to recognize that wanted activities are always changing and be flexible enough to accommodate that. The board on Dec. 14 also approved amendments to Ordinance 1 — the district’s trash law — in a 4-1 vote. Trustee Matthew Dent was opposed. In July 2016, IVGID entered into a franchise agreement with Waste Management for garbage and recycling services. That launched on October 1. The new contract forced the board to look at updating Ordinance 1 to determine if any amendments were needed to ensure its language is consistent with the district’s plans to beef up enforcement for violators. In September, the board discussed at length violations to the law and what the penalties for improper disposal of garbage should be. According to previous reports, it was decided that a residential or commercial property will revert back to zero offenses following a change in ownership, and that it is the responsibility of the new property owner to determine his or her appropriate level of trash and recycling service — and from there, to contact Waste Management. The main changes to the law include stiffer fines for trash violators. For example, a first offense for a residential customer means he or she will be mandated to use a wildlife-resistant trash cart. A second offense results in a $100-$999 fine, while subsequent offenses would net fines of between $500 to $999. A first offense for a commercial property, meanwhile, carries a fine up to $999, with subsequent offenses costing between $500 to $999.